In late 1997, a runaway teenager and her small yellow toy robot travel west through a strange American landscape where the ruins of gigantic battle drones litter the countryside, along with the discarded trash of a high-tech consumerist society addicted to a virtual-reality system. As they approach the edge of the continent, the world outside the car window seems to unravel at an ever faster pace, as if somewhere beyond the horizon, the hollow core of civilization has finally caved in. Simon Stålenhag is the internationally lauded artist and author of Tales from the Loop and Things from the Flood, the narrative art books that stunned the world with a vision of an alternate 1980s and '90s Scandinavia where technology has invaded the tranquil landscapes to form an entirely new universe of the eerie and the nostalgic. He lives in Stockholm, Sweden. "One part art-book, one part picture-book—the mundanity of everyday relationships play out alongside science fiction imagery that is as beautiful as it is unsettling." "[Simon Stålenhag's] stories crawl into my brain and mess with my memory of history, time, and place. His art (photorealistic, washed out, laced in neon or icicles, nostalgic and futuristic both at the same time) gets into my eyes and stays there. [. . .] If you're anything like me, you'll take those images to bed with you for a long time and dream of Stålenhag's America — lost to sand, to drought, to war, to loneliness, and stalked always by the low, distant rumble of something terrible rising out of the earth and coming for you." 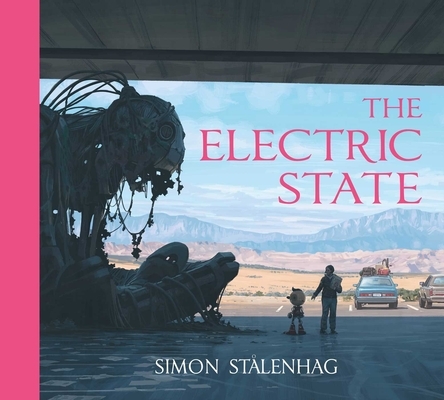 "[The] mix of science fiction and real world pop-culture nostalgia is instantly compelling, but there are layers to The Electric State that take the story beyond surface value. [. . .] In a way, it is an extremely American story, bringing together themes like the intersection of war and technology; fire-and-brimstone religion and its effect on LGBT youth; families separated by great physical distance while still being a part of the same country."